For some motorists, level crossings are part of day-to-day driving. But for others the prospect of coming into close contact with a railway line remains daunting. Last year, Network Rail revealed an average of 46 incidents take place at level crossings every week, resulting in six fatalities since 2013. This shocking abuse of the level crossing happened at Ducketts crossing between Bradford and Leeds. At a level crossing in Greater Manchester, you can see these drivers ignoring the warning lights and getting wiped out by the safety barrier. But level crossings needn’t be a cause for concern. To help keep you safe, here's our complete guide to what they are, and how to cross them. How safe are level crossings? What safety measures do level crossings have? How do I drive over a level crossing? What should I do if I breakdown on a level crossing? When are level crossings more dangerous? Are there cameras on level crossings? A level crossing is where a road crosses a railway line. Level crossings are usually demarcated by signs, lights and other safety measures such as barriers and gates. There are around 3,800 level crossings on the UK’s public and private road networks, with several thousand more railway crossings on footpaths and bridleways. Network Rail estimate that over 9,000 incidents have occurred at UK level crossings since 2012, with almost half of these directly caused by driver error. In a bid tackle this issue and improve the safety of the rail network, Network Rail has closed 1,100 level crossings over the past decade and improved visibility and sighting at a further 1,100 crossings. 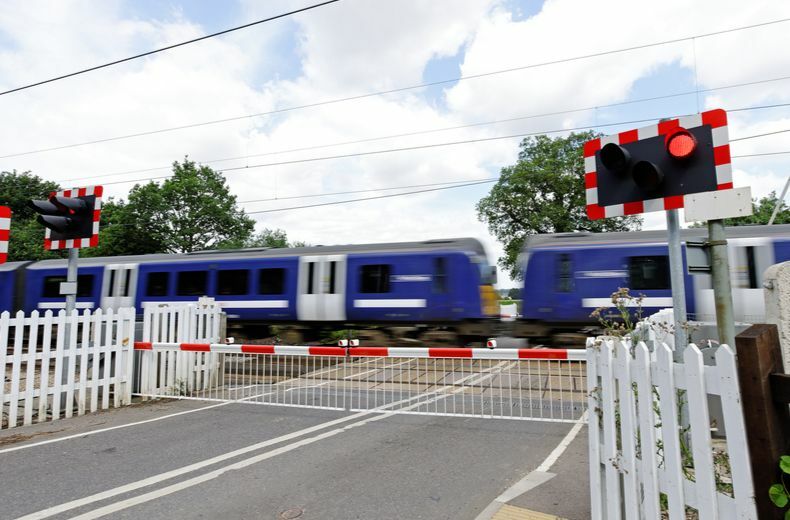 They have also upgraded crossing technology to improve information and visibility, installed new barriers at 66 previously open crossings, and run several campaigns aimed at raising driver awareness of the dangers of level crossings. However, the safety of level crossings depends on the motorists themselves, so it’s imperative drivers educate themselves to the rules surrounding level crossings and heed all safety measures and warnings. Road crossings – what’s the difference between zebra, pelican, puffin, and toucan crossings? There are five types of safety measure in place at and approaching level crossings – road signs, sirens, barriers, lights and road markings – although not all level crossings will have all four types of warning in place. Road signs: The most common safety measure are road signs warning of an upcoming crossing, indicating whether the crossing has a gate or not, or if there are any other issues you should be aware of. If there is no gate or barrier, there will be red St. Andrew’s Cross sign indicating the level crossing. Signs will also indicate the location of a phone, should you need to contact the signal operator. Sirens: Some level crossings have sirens or other audible warning systems in place. These will activate when the train is approaching and could sound like sirens, train horns or even spoken warnings. The type of alarm depends on the crossing itself, so if you’re in the vicinity of a level crossing make sure you’re able to hear the siren by turning down any music or radio you may be listening to. Barriers: Some crossings are ‘open’ and don’t have a barrier, but most have either a full barrier, which blocks the whole road, or a half barrier, which only blocks one side of the road. The barrier will be lowered when a train is approaching and you should not enter onto the track until the barrier has been fully lifted. Never swerve around half barriers in order to cross the track as this is incredibly dangerous. Lights: Along with signs, lights are the most common safety measures at level crossings, and the majority have amber and red lights that flash when it is unsafe to cross the train track. You should stop when red lights flash and stop when amber lights flash unless you have already crossed the stop line, in which case you should continue out of the yellow box as quickly and safely as possible. Road markings: Level crossings will usually have a solid white stop line that you should stop at if warning lights start, the siren sounds, or the barriers start descending. Some crossings also have yellow boxes marked on the road. These should be treated as normal yellow box junctions and you should not enter into this area without ensuring your exit is clear. If you’re in doubt about any of these warnings or are worried they’re faulty, it’s essential you remain safely behind the stop line and contact the signal operator. Do not drive onto the railway line if you are unsure it’s safe to do so. You should always approach a level crossing with caution, particularly in adverse weather conditions, as you never know when the lights will start flashing and you’ll need to react accordingly. If there are no warnings about a train approaching, drive slowly and do not enter the crossing unless your exit is clear. Never drive nose-to-tail on a crossing, so even in heavy traffic make sure your exit is clear before passing through. If warning lights are flashing or the barrier is down, wait until the train has passed and the barrier has fully lifted and the lights have stopped flashing before entering the crossing, again making sure that your exit is clear first. If amber warning lights start flashing after you’ve passed the stop line continue forward and exit the crossing. If you haven’t passed the stop line, stop and wait for the train to pass and all warnings to stop before continuing. On open level crossings where there are no barriers or lights, you’ll have to approach the crossing with extreme caution, checking and listening for trains before proceeding. To limit potential danger, you should always make sure your exit is clear before entering a level crossing to ensure that you never have to stop or reverse your vehicle on the railway track. What should I do if I break down on a level crossing? If you break down or are involved in an accident on a level crossing, the first thing you should do is ensure all passengers get out of the car and move safely away from the crossing. Next, inform the signal operator of the issue by using the track side telephone at the crossing and follow any instructions they give you. If there is no phone, call the emergency services and tell them what has happened. If possible, move the vehicle clear of the crossing if there is time before the next train arrives but remember – if at any time the sirens sound or warning lights come on, leave the vehicle and immediately get to safety away from the crossing. Network Rail estimate that incidents involving vehicles at level crossings are more common between the hours of 7am and 6pm from Monday to Friday. However, just like any driving environment, level crossings can also be affected by weather conditions such as rain, ice, snow and bright sunlight which can all reduce drivers’ visibility of lights and signs and impair reaction times. When approaching a level crossing in adverse weather conditions make sure you are driving at a safe speed and always ensure your exit route is clear before entering the yellow box. To improve safety and catch motorists who break the law, cameras are being installed at level crossings across the UK aimed at catching those drivers who jump the red light – working in a similar way to traffic light cameras. If you’re caught by one of these cameras, you face being hit by a £60 fine and penalty points on your licence. Should the police deem your offence to be more serious, you could be taken to court and face far more serious punishments.